A simple dish to throw together these salmon and veggies in foil packets are an easy, tasty and very low mess way of prepping a nice fillet of salmon and some beautiful fresh veggies. Use whatever veggies float your boat. Here I’ve used baby courgettes, sweet red peppers and asparagus but you could use bok choi, tomatoes, aubergine. Lemon slices are a really nice addition too but sadly I didn’t have any in! You can prep them in advance and then store them in the fridge so they’re great for a weeknight supper. – Heat the oven to gas mark 5. – Lay all of your veggies out on a large sheet of foil. – Place the salmon on top. – Fold in the edges of your foil to make a sealed parcel. – Place in the oven and cook for 45 minutes until the veggies are tender and the salmon cooked through. 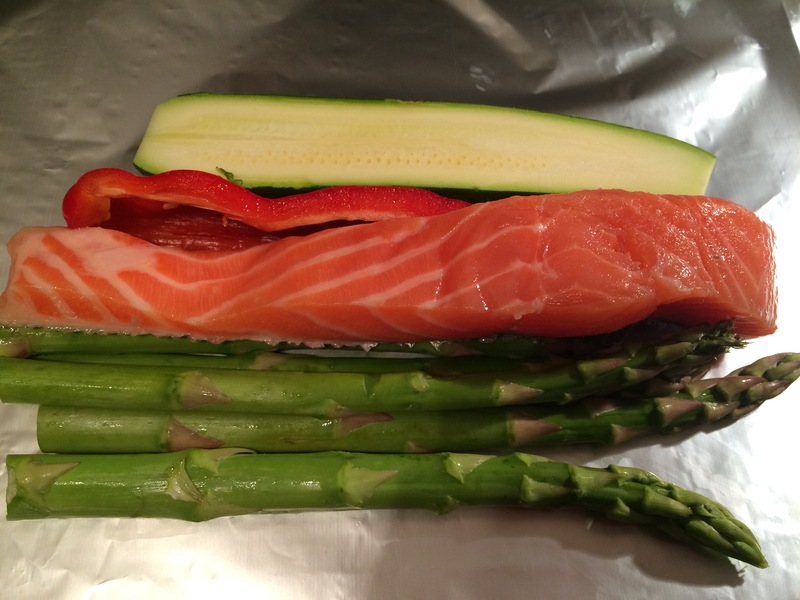 I love salmon and asparagus and yet somehow, I never thought about making them this way. I’m going to give this recipe a try. You make it sound very simple 🙂 Thanks for sharing! That’s the great thing, it really is ridiculously simple! Absolute minimum effort for a whole lot of deliciousness!